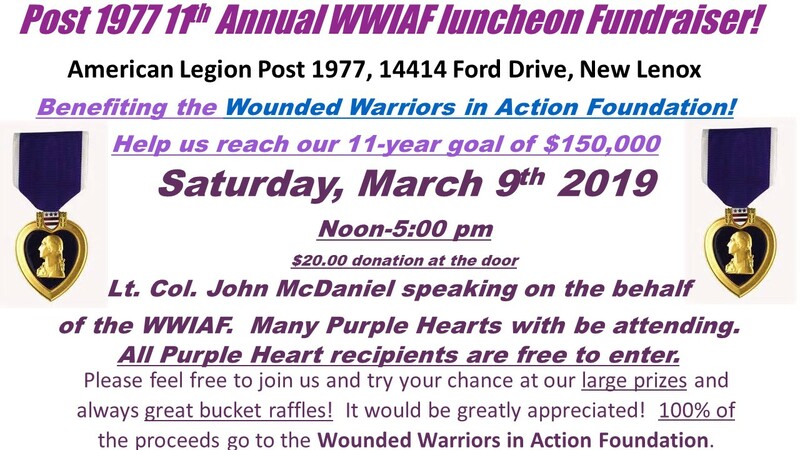 Join us at the 11th Annual Wounded Warriors in Action Luncheon for our Purple Heart Veterans on March 9, 2019! This important event will be held at the Thomas E. Hartung American Legion Post 1977 located at 14414 Ford Drive in New Lenox, IL. All proceeds from this event will go to the Wounded Warriors in Action Foundation which serves our nation's combat-wounded Purple Heart recipients by providing world-class outdoor sporting activities as a means to recognize and honor their sacrifice, encourage independence and connections with communities, and promote healing and wellness through camaraderie and a shared passion for the outdoors. The luncheon will start at noon in our main hall and the presentation will begin at approximately 2:00 pm. Our guests will include Purple Heart Veterans from across the Country and some of our locals too! You don’t want to miss your chance to be a part of this event. We will have incredible raffles throughout the day and drawn right after the presentation. $20 at the door.